Severe Thunderstorm Developed Tuesday over north parts of Saudi Arabia and moved east, these storms produced very heavy rain and some hail, more than 50 mm of rain was reported in some areas across this line of heavy thunderstorms that stretched from Jordan/Saudi Border north west to east of Iraq up until the far north of the country. This system is one of the very few systems i have ever seen with this cloud strength and cloud cover, these clouds are all CB type of clouds which develop usually in the Tropics, sudden development of these clouds produce very high winds and heavy rain with flash floods in any area they hit. the interesting part is that most weather modules are still predicting that this system of unstable weather will continue to affect most of the Gulf until at least the 6th of May!! and by the looks of this system the conditions that are producing this system seem to be holding up much more than usual. This year is moving to being a real unusual season by all means, and it is a year to monitor. The most interesting characteristic this year is the moisture that is fueling the Gulf with needed upper level convective energy, it has been ongoing and acting as a main source of instability when colliding with any approaching cold front, there is an open bridge stretching from Africa towards the Gulf in continues moisture feeding to the area , if this continues we will see Tropical weather staying for some time across the Gulf! something that i have personally not seen happening in my life time. Weather Forecast for the coming 48 hours, expected thunderstorms developing across much of the north parts of Saudi Arabia , and some might reach Riyadh Area, Kuwait should be watching for some severe weather in the coming 48 hours, with high winds , sand storms, and severe thunderstorms with heavy rain. the system will then move east and south east with a chance to affect more parts of the Central Gulf though we will keep on monitoring the situation and updating it in the coming few days. Why i say unusual weather? well this is the part of the year where we start to get temperatures rising above 30’s Degree but still many areas in the Gulf are under or around this figure and we are getting close to the end of April ! on top of that moisture from Africa is still fueling thunderstorms and wide spread cloud coverage over much of Saudi Arabia , these clouds are developing some times early morning and extending towards the night , which is unusual for this time of year , the usual is temperatures around 30 to 35 over much of Saudi Arabia and thunderstorms which develop afternoon mostly and live for few hours until the sun sets down. All weather modules seem to be suggesting more rain and thunderstorms until this weekend over the north and the north west as well as the central part of Saudi Arabia, heavy rain is expected and in some parts over 50 mm. The weather pattern of the past few days will continue. 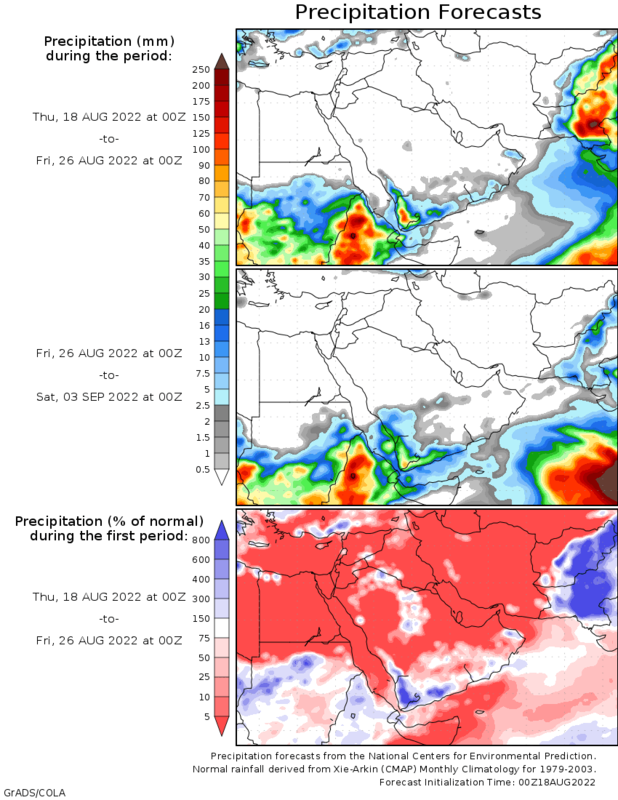 Jeddah should also be on a weather watch for sudden thunderstorms starting tomorrow. The fuel from the humidity of Africa is still spreading towards the Gulf, very strong thunderstorms were the result of this continuing fuel, we are still under the influence of this jet stream of humidity stretching from south Africa up to the north and north east. 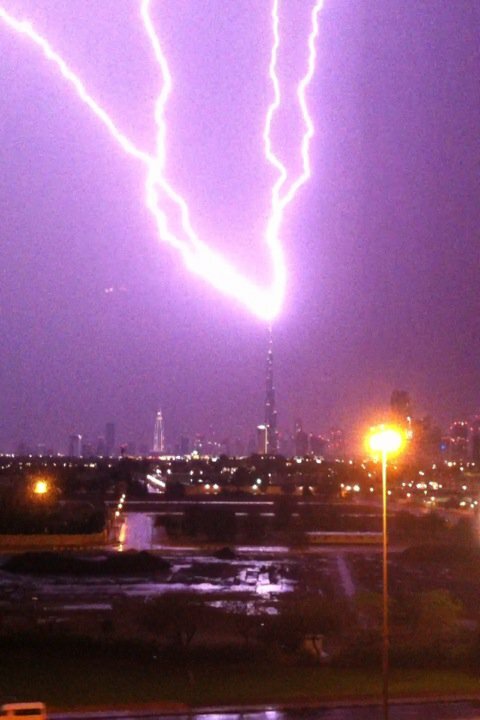 Severe thunderstorms developed last few days over allot of the areas including Riyadh. Qatar, Bahrain and the UAE. The system will stay feeding moisture towards the Gulf in the coming few days and more rain is expected though this time it will be more concentrated towards the Central and north western areas. Jeddah should be on a watch for the coming 4 to 5 days for any sudden thunderstorms , these thunderstorms will have heavy rain. Riyadh will see on and off rain for about 3 to 4 days this week so enjoy this weather its real spring !! temperature are holding down due to the clouds and rain in the area and should stay at these averages for the coming few days. For Lebanon and the Mediterranean area the weather should be very nice and beautiful, no rain is expected for the coming days only slight chance of isolated afternoon showers , other than that it should be a sunny and cool few days ahead. There is also one more system that should affect the Gulf area by the end of this month, so keep the umbrellas with you ! A system of unstable weather will start to affect most parts of the Gulf , Including the UAE, Qatar , Bahrain and the eastern parts of Saudi Arabia. Rain and thunderstorms is strongly possible starting today and will increase by the coming 48 hours across these areas. most intense rain is expected along the eastern province of Saudi Arabia including Bahrain by this Wednesday, expect to see some sudden thunderstorms along this system with strong winds and sudden dust storms as well. Temperatures will fall slightly along with this system. unstable weather will continue to mid next week. This month is known for harsh changes in weather, from cool weather to spikes in temperature and sudden thunderstorms with high winds and hail . looking at all the weather modules it seems that there will be two fronts , one will affect the north and north east through the coming few days with a small chance of some rain across that area. The other front seems to be a strong one and should start to affect us by 10th of April, this front seems to have the potential to produce severe thunderstorms across north east including Kuwait , eastern province , Bahrain, and Qatar starting from the 10th till the 15th of April. Temperatures are expected to rise through this week and through this month , slight decrease in temperatures when these fronts pass us. in short, small chance of rain from 1-10th , while very high chance of severe thunderstorms in the eastern area of the Gulf from 10th to 15th of April.